The full outfit that I have been wearing on 4th day of London Fashion Week. So lucky that we have avoided the freezing cold and snow during the Fashion Week, because it would have been so unpleasant to run outside in such weather. As I have already mentioned earlier in previous posts, green is becoming I guess my chosen colour for this season, or just patiently waiting for spring to come. But who said that we can't wear dresses and skirts in the winter weather? 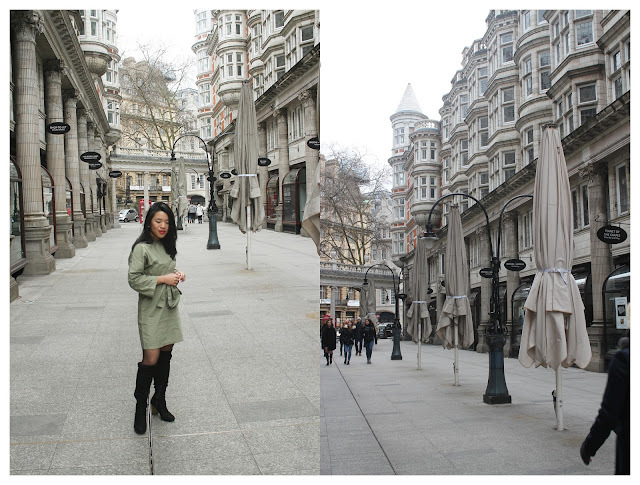 This khaki/olive colour wrapped dress is from Asos, pairing with fish eye tights and over knee heeled boots from Office Shoes.